Brisket is an entree that most people reserve for special occasions. It's a labor of love, best when slow cooked for hours and hours until tender and juicy. That's where the magic of pressure comes in: when prepared using a pressure cooker or multi-cooker like the Instant Pot, you can have brisket any night of the week. The appliance simulates long braises, producing the same savory dish in a fraction of the time. When buying your meat, look for a cut that's about two pounds and trimmed of excess fat. If you don't see it on the shelves, ask the butcher to cut it for you. Cooking for a crowd? Get a four-pound brisket and cut it in half so it will fit in your cooker, then simply double the rest of the ingredients. 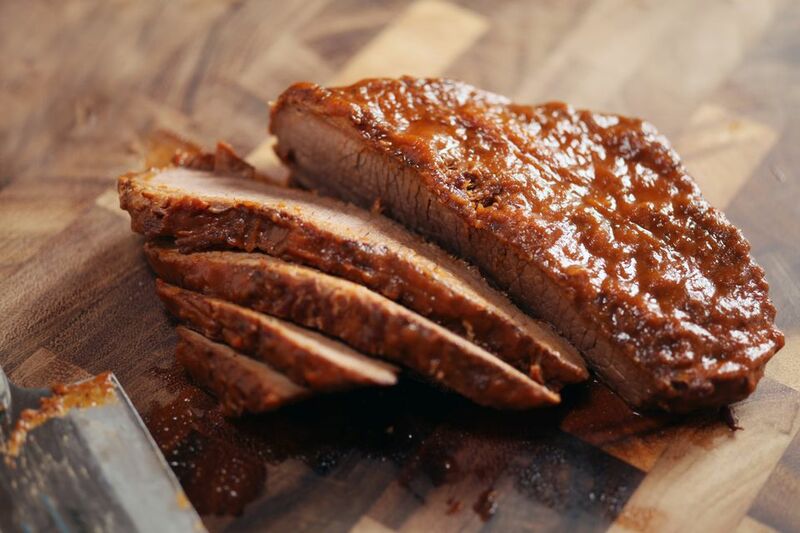 Serve your brisket with mashed potatoes or rice to soak up all of the delicious sauce. And don't forget red wine! Turn on the Sauté function on your Instant Pot and let it preheat. Once hot, add the oil and coat the bottom of the pot. Season the brisket with salt and pepper on both sides and add it to the pot with one side fully in contact with the hot pan. Let cook for 2 to 3 minutes without moving, until browned on one side. Turn the brisket and repeat, browning the other side. Remove from the pot and set aside. Add the onion and sauté for 2 minutes. Add the garlic and sauté for 1 more minute. Add the wine and scrape the bottom of the pan to loosen any browned bits. Let simmer for about 3 minutes, or just until the alcohol smell has cooked off. Turn off the Sauté function. Add the tomato sauce, Worcestershire, herbs, and bay leaf. Season with salt and pepper and stir. Add the brisket back to the sauce and nestle in. Secure the lid. Cook at high pressure for one hour and use a natural release. Once the pressure has released, carefully remove the brisket and tent with foil. Turn on the Sauté function to the Low setting and cook for about 10 minutes, or until the sauce has reduced and thickened slightly. Slice the brisket against the grain and serve covered in sauce. Store leftovers in the fridge in the sauce.